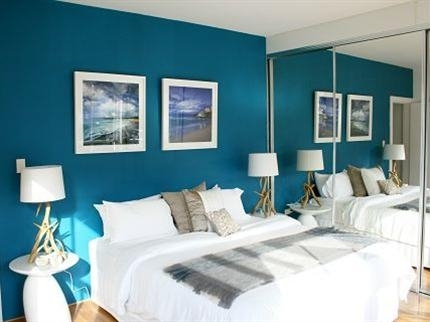 The Sandridge Apartments Bondi Beach These fabulous beachside apartments are located within an exclusive boutique complex of only three apartments. Located next to the world famous Bondi Beach, The Sandridge Apartments are the perfect vantage point from where to base your Sydney beach side vacation. The crisp white exterior is reminiscent of sea side villas all around the world, and the beautiful beachside interior styling of these apartments relates to the sun, sand and sea around you, making your stay at beautiful Bondi beach a relaxing and indulgent holiday experience. There are two apartments available, '2 Bedroom Apartment 'which is a mid level apartment with 2 bedrooms and 2 bathrooms, and the '2 Bedroom + Study Apartment' which is the top level apartment, with 2 bedrooms, 2 bathrooms and a third bedroom/study on the roof top level. The Standard 2 Bedroom Apartemnts have two spacious and elegant bedrooms, located at one end of the building, away from the living areas. The master bedroom is beautifully furnished - an elegant and relaxing space. One whole wall has built in mirrored wardrobe space, there is an indulgent king size bed and the room is completed with beautiful furnishings and stunning phtographic artworks. The second bedroom is also very spacious and also has a king size bed (can be separated into 2 x single beds), also has large wall to wall mirrored built in wardrobe space and beautiful bedroom furnishings and and stunning phtographic artworks. Both bedrooms have beautiful American Oak timber floors throughout and fluffy white sheepskin rugs. Each apartment has two bathrooms. The main bathroom is generous in size and has black granite benchtops, twin sinks, toilet, shower and full size bathtub. The second bathroom is loacted at the opposite end of the apartment and has shower, toilet sink with black granite benchtop and also contains the the internal laundry, including a top load washing machine, drying rack, iron and ironing board. All bathrooms have beautiful Molton Brown Bath & Body Products. Bath towels, hand towels, face washers and bath mats are all provided. The lounge, dining and kitchen are an enormous open plan space with fresh white walls, 3m high ceilings, polished American Oak timber floors and plenty of natural sunlight. 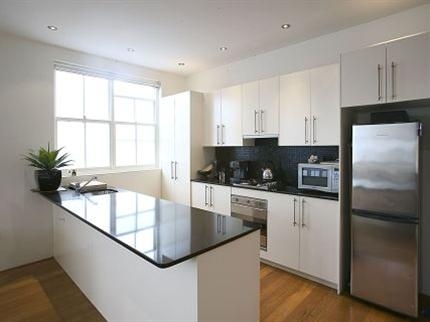 Kitchens are fully equipped with full size fridge/freezer, dishwasher, microwave, oven & cook top. All cooking utensils, cutlery, glassware and crockery is supplied, as well as detergents and tea towels. Living room furniture is modern minimalist with beautiful Knoll marble dining table, bertoia wire chairs, sleek lounges and armchairs and not forgetting the 42" LCD TV, DVD player and CD stereo. There is also a laundry with top loader washing machine and detergent is provided. The 'Premium 2 Bedroom + Study Apartment' is the top floor apartment, with two spacious and elegant bedrooms, located at one end of the building, away from the living areas. The master bedroom is beautifully furnished - an elegant and relaxing space. One whole wall has built in mirrored wardrobe space, there is an indulgent king size bed and the room is completed with beautiful furnishings and stunning beachside photography. The second bedroom is also very spacious and also has a king size bed (can be separated into 2 x single beds), also has large wall to wall mirrored built in wardrobe space and beautiful bedroom furnishings and stunning photographic artwork. Both bedrooms have wall to wall carpet and fluffy white sheepskin rugs. Theapartment has two bathrooms. The main bathroom is generous in size and has black granite benchtops, twin sinks, toilet, shower and full size bathtub. The second bathroom is loacted at the opposite end of the apartment and has shower, toilet sink with black granite benchtop and also contains the the internal laundry, including a top load washing machine, drying rack, iron and ironing board. The lounge, dining and kitchen are an enormous open plan space with fresh white walls, 3m high ceilings, polished American Oak timber floors and plenty of natural sunlight. The fabulous recycled timber dining table is offset by funky wire Bertioa wire dining chairs, anmd the oversized white leather lounge is simply stunning. Leading from the lounge area is a spacious outdoor terrace which peeks through to Bondi Beach and the neighbouring park. A fabulous L shaped outdoor lounge setting makes this a perfect spot for relaxation, on a warm sunnyt day or through tose balmy summer evenings. 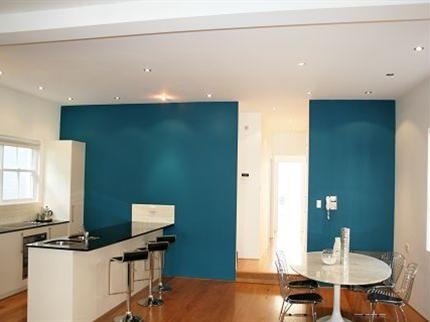 Kitchens are fully equipped with full size fridge/freezer, dishwasher, oven & cook top, and microwave. All cooking utensils, cutlery, glassware and crockery is supplied, as well as detergents and tea towels. 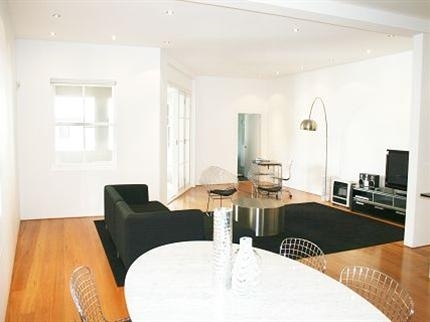 Living room has a sleek white 32" LCD TV with in built DVD player and CD stereo. 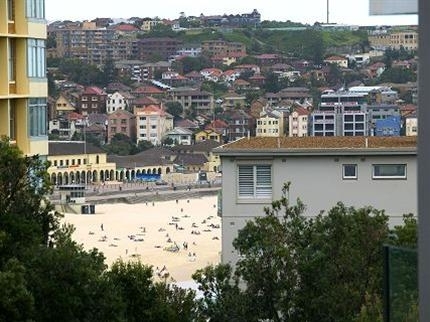 Located at the south end of Bondi Beach, between Bondi and Tamarama, these apartments are only a stones throw from the waters edge, the main beach area, as well as the central village of shops, bars, restaurants and cafes. The world famous Bondi to Bronte Coastal walk is located three doors down, and is THE MUST DO Activity when you visit Bondi Beach, or even Sydney. One car space is available at an additional charge of $25 per night. PLEASE NOTE: There is no reception or front desk at the apartments, so guests need to check in by appointment. Guests must provide a valid email address so Apartment Hotel can arrange check in with Guests directly.